This gentleman loves burritos so much that he decided to make it official… well, semi-official. Everyone likes a burrito now and then, but one guy liked burritos so much that he thought there should be an award for it. 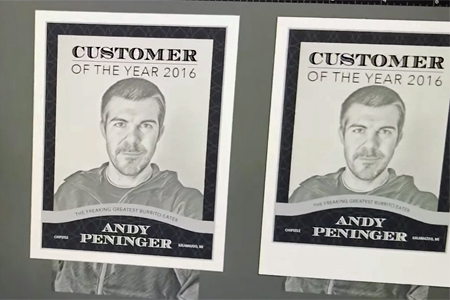 Andy Peninger is a frequent visitor to the branch of Chipotle in Kalamazoo, Michigan and decided to play a harmless prank on the staff there. Andy made a video that details the painstaking care than went into his faux prize… and then filmed himself sneaking into the restaurant and sticking the “certificate” on the wall. “You've got to see the reactions people had from the award!” laughs Andy. The reactions from the staff range from amusement to bafflement. It’s the ideal feel-good video to get you through the first week back at work.